Christopher MacDonald is Chinese-to-English translator and interpreter based in the UK. He spent a year in Xian, in 1985, and has since lived and worked in Taipei, Hong Kong and Shanghai, as a translator, interpreter, and trade and investment consultant. He has recently brought out The Science of War, which is supported by a new translation of the classic text, The Art of War. The Art of War is an ancient Chinese military treatise attributed to the strategist Sun Tzu. It is composed of 13 chapters, each devoted to a distinct aspect of warfare and how that applies to military strategy and tactics. For more than two thousand years, strategists in China have followed its system of military teachings. This has now also influenced Western thinking, not only in the military sphere, but also in realms such as business and the law. 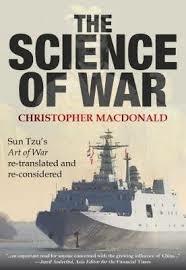 In The Science of War, Christopher MacDonald tells how military principles and teachings first crystallized into Sun Tzu’s treatise and how they guide China's leaders’ thinking to this day. Here Christopher discusses why he chose to translate The Art of War, and why his own book is called The Science of War. I started translating Sun Tzu in 2006 and didn’t finish till 2016. It’s only a slim volume by modern standards – around 6,000 Chinese characters, or 10,000+ words in English. That’s around 50-60 pages of a paperback book, allowing for section breaks. What took so long? And why another version of this much-translated classic? First, to explain. I started the project out of curiosity, mixed with a bit of arrogance. I was aware that The Art of War, as Sun Tzu’s treatise is mostly known in English, has a reputation for its profound insights into the nature of war and conflict in general. For those who grasp the full import of the thing it apparently offers a magic key to victory. The secret to fighting “a hundred battles without ever facing defeat”, no less. Surely, I thought, I could benefit from a tactical and strategic masterclass in conflict from one of history’s black belts in the discipline. And what better way to absorb the wisdom of Sun Tzu than to than to inch through the text, character by character, until the essence of the piece had seeped into me? What’s more, I imagined I might be able to do a better job than some of the translations already in circulation. The first problem was to figure what if anything was so special about Sun Tzu, because at first glance it wasn’t clear, from existing translations, what the big deal was. Some of the so-called wisdom in the treatise seemed almost parodic; either banal (“When an action is advantageous, take it; when it is disadvantageous, refrain from it”) or wilfully obscure (“The skilful strategist cultivates the Way and preserves the Law”). Was Sun Tzu overrated? When I started to read and make notes on the original, aided by the annotations of two millennia of Chinese commentators and a century of Western commentary, I noticed among the characters something unexpected: the voice of a pragmatic, no-nonsense military man. An expert in the field distilling his own hard-earned experience into a succinct and well-ordered system of thought. Not one to waste words on woolly thinking. Later, as the work of translating and re-translating proceeded I came to recognise shifts in tone among the thirteen chapters of the treatise and sometimes among paragraphs within individual chapters. The text appears to have been worked on by different hands in the course of being compiled, an impression which is supported by the findings of textual analysis in recent years. Nevertheless, the prevailing tone remains relatively consistent – the terse delivery of a battle-tested commander, as wary of armed conflict as he is fascinated by it, and determined, in his ordered, methodical way, to demystify the topic for his sovereign, for his disciples, or for both. I aimed as far as possible to bring this character with me into modern English, and do my own bit to demystify Sun Tzu. The next challenge was to find out what else, if anything, lay beneath the surface of Sun Tzu’s often mundane instructions to plan shrewdly, to wrong-foot the enemy at every turn, to reward your spies well and so on. Was the treatise primarily a menu of crafty tactics? That would have made it a useful vade mecum for any commander on campaign, at least, but did that justify the legendary reputation? A pointer here came from Cao Cao, the scholar-warlord who dominated the era of the collapse of the Han dynasty, in around AD 200, and who features as the anti-hero in the Three Kingdoms tales known to all Chinese children. Cao annotated Sun Tzu early in his career, and it was his commentary that canonised the treatise for future generations. Intriguingly, in his preface to Sun Tzu, Cao wrote: "I have read plenty of volumes on military matters and battlefield tactics, among which Sun Wu’s is the most profound…. It cannot be faulted in its detailed attention to assessing conditions ahead of battle, its emphasis on military mobilization, its clarity of strategic conception and its depth of tactical design. Our contemporaries, however, have failed to truly grasp the substance of its teachings, and while implementing many of the lesser points they miss the main thrust." The "main thrust" appeared to include these: planning, assessment, mobilization, strategic conception… A recognition that victory in battle doesn’t have to be left to chance, but can instead be the logically anticipated outcome of a process of detailed preparation across a range of interconnected domains. And also: see the big picture. Look beyond victory in battle to the wider campaign, and beyond a victorious campaign to the overall strategic arc of the conflict. A further pointer to Sun Tzu’s "main thrust" emerged as I began to get to grips with Chapter Five of the treatise, a relatively short tract which operates as the fulcrum of the whole work. Its topic is shi (势), a term coined by Sun Tzu to describe the shifting balance of temporal, spatial and psychological advantage between combatants, by which the outcome of their struggle is ultimately determined. According to Sun Tzu, when one side or the other successfully harnesses the cumulative shi and gains what I came to translate as “strategic dominance”, that side’s impetus towards victory becomes inexorable. Sun Tzu illustrates the concept with a series of striking metaphors from Nature: shi is the momentum of boulders rumbling down the flank of a mile-high mountain, the fury of a flash flood crashing through a gorge, and the deadly swoop of an eagle breaking its prey on impact. Taking control of the shi, whether within a battle, or a campaign, or across the span of a long-gestating struggle with a strategic foe, was therefore the key to preserving your kingdom amid the never-ending war of all against all that characterised the Warring States period (5th century to 221 BC), when Sun Tzu’s teachings first circulated. A neat elucidation, tying Sun Tzu’s conception of shi to the deep-rooted practices of Chinese statecraft, is supplied by Henry Kissinger in his book On China: "In general, Chinese statesmanship exhibits a tendency to view the entire strategic landscape as part of a single whole….Strategy and statecraft become a means of ‘combative coexistence’ with opponents. The goal is to manoeuvre them into weakness while building up one’s own shi, or strategic position." As I took on board the concept of shi, it became increasingly clear that Sun Tzu advocated more than just canny tactics to see you through battle. Shi showed that the ploys, bluffs and wily manoeuvers of an ace general, necessary though they may be, depend for their effectiveness on deep undercurrents in the conflict, and the primary task for any kingdom facing possible annihilation under the swords, chariot wheels and crossbow bolts of its enemies was to recognise and steer those undercurrents by means of a long-term, all-embracing scheme of action. In effect, Sun Tzu outlined an embryonic theory of something that Warring States China didn’t yet have a name for but which we now know as “strategy”. With these observations in mind, my purpose in attempting a new translation of Sun Tzu came into focus. Rather than a scrapbook of randomly grouped, occasionally baffling aphorisms on warfare, I could now see Sun Tzu’s bingfa (“military methodology”) as a reasonably well-ordered presentation of tactical and strategic principles and approaches, packaged into a coherent system which seemed to me to have more the character of a “science” than an “art”. Much of what I subsequently learned in the course of translating the treatise, and what merits its status as one of the world’s most profound and insightful works on military strategy and tactics, is probably already self-evident to anyone who has personal experience of senior military command, or who knows the ins-and-outs of interstate struggle from a position of national leadership. But for anyone else who is willing to put in the hours, this new translation should make the old commander’s teachings more intelligible than before. For the benefit of readers in English wishing to understand the historical and military context, the translation is prefaced with explanatory essays on origins of the text and how it has been applied through the ages, concluding with an examination of the military and geostrategic priorities of the Chinese Communist Party – the “sovereign” atop today’s PRC – for whom Sun Tzu is very much an active influence. Piecing together these essays partly explains why the book took longer to complete than expected. (Innate laziness and “the pram in the hall” also played a part.) As it turns out, these essays have become the focal point for many of the book’s readers – with the translation appended as little more than a handy reference. Regardless of how readers approach Sun Tzu, my hope is that this updated presentation of his teachings, in The Science of War, offers a useful new perspective on some of the underlying trends and drivers in the interstate rivalries of East Asia today. Details: The Science of War is published in eBook and paperback by Earnshaw Books. Priced in local currencies.